I’ll admit first off when I read the blurb I wasn’t too thrilled, the concept and the way the initial promo art was presented felt like it’d be another uninspired show that was churned out just so the studio could make some spring profits. But I soon found that my first impression and cover-reading had been completely off. Kiznaiver takes something that isn’t new territory but couples it with an fresh concept and has enough depth that the initial excitement doesn’t vanish. 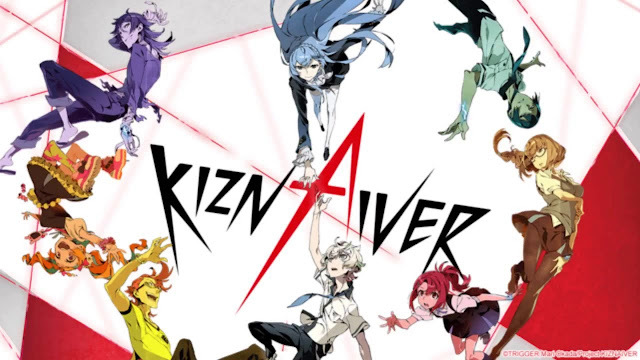 For this reason I suggest you watch Kiznaiver completely blind without any research and I guarantee that you’ll enjoy being surprised as much as I did. The animation in this one is some of the most gorgeous I’ve this entire spring season. The backgrounds are deep and detailed to the smallest degree; the skyboxes feel lifelike and fit each scene’s mood perfectly. Every location has its own unique colour palette and thus everything has its distinct feel to it. Without any words or movement you can immediately tell the mood of the scene just through how it’s lit and coloured. There’s a wide range of cool looking shots and movements that are quite impressive of a director's debut project, (Hiroshi Kobayashi) and they deliver a good visuals and clever subtext to analyse. The lighting and shadow work is hand-downs some of the best I’ve ever seen. Some of the best shots are created by how the lighting is composing and there’s so much variation from a peaceful sidewalk being dappled with sunlight to a cold, grey facility with bright blue neon screens. The CGI were occasionally applied isn’t intrusive and is handled very well blending in seamlessly. Character movement is fluid and reactive with a lot of small touches so there’s no static feeling. Fight scenes and fast movement are done exceptionally well with fights being very grounded in reality and not too flashy so when a character jumps off a bridge onto a highway we can feel him hitting the ground. The characters are presented in a catching line art style that looks like it's been done with a pencil. There’s a lot of detail given to posture and body language so every character stands differently and how they walk, move their arms all reflects on their character. There’s also a lot of emotion portrayed in the eyes. The designs while not the most original are at least distinctive and as I mentioned before my initial opinions on the characters or what I could tell from the designs, at least ,weren't good. It looked every other group of students in a high-school set anime. There was: the squealing child-like rich girl, the cold, smart girl, the buff meathead and so on. And that’s what they are presented as, to start off with, but the writing was good enough to make them likeable and I found myself becoming quite attached to them as the story went on. The show is very self-aware that these characters have been done before and uses that knowledge to make them colourful and shining examples of why these tropes are so popular. If I had to find fault with something in the writing I’d point out the lack of mystery. I , at least personally was very engrossed in the story I had no burning questions no character who I just needed to know about. Not a big fault but something that could be worked on. Our MC falls in the camp of the quiet and anti-social kind but the story matches and revolves around him being like this, so instead of being a tired archetype it's a method to advance the story and develop the rest of the cast. The pacing of the story is quite slow and it takes the two first episodes to simply introduce us to the world and get us comfortable with the characters, something I can admire as most shows try to shove everything down your throat in the first five minutes. The humour is also very subdued and stays in the background for the most part. I got a lot of laughs from the way it slips mundane things into abnormal situations i.e. a character wearing a hard hat during a fight scene this also applies the other way round like how there are weird mascot aliens running around town and nobody questions it. The soundtrack just like the characters and art style has an immense variety with a wide range of styles and speeds to fit the tone perfectly when needed. The opening is also very strong more-so in terms of visual. There’s groups of bright lights and dazzling colours that blend and twist together a clever way to present the key idea of connecting with people and representing the visuals of the show and its use of lighting. All the voice-actors do a great job representing the character and no one sounds out of place which is not too surprising looking at the cast. Who have all been in involved in large scale projects such as K-ON, Assassination Classroom, Hunter X Hunter, to name just a few.